I am a tea drinker and love to take my home brewed tea with me, both hot and cold. This Stainless Steel Tumbler works great for either. It holds a full twenty ounces of liquid and comes with a shatter/spill/splash proof clear plastic lid to minimize messes. I appreciate that the tumbler's long slender design make fit nicely in my car’s drink holder. Additionally, my mind is set at easy knowing that this tumbler BPA free and backed by an unlimited guarantee. 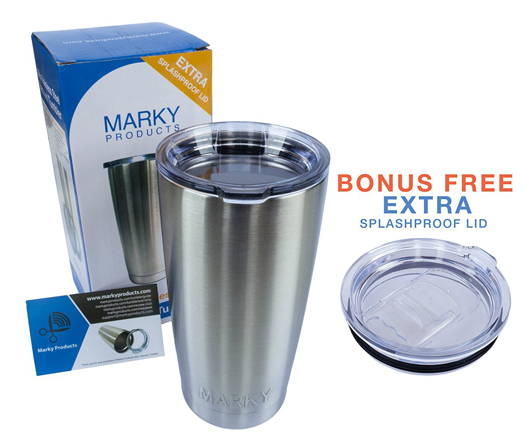 This is one of Marky Products signature products due to its sleek and efficient design. It is to be complemented by available accessories such as handles, closing tops and straws. Metal decanters keep ice 2X longer than plastic beakers and are designed for maximum ice preservation - they work just as well for hot beverages. WORRIED ABOUT SPILLING YOUR DRINK? This has an ideal shatter/spill/splash proof environmentally friendly sealed BPA free clear lid making it the perfect drinking mug. SUPERIOR VALUE SET – comes with Marky Products tumbler and new bonus closable shatterproof sliding lid ($7.95 value, free), which doesn’t leak. IDEAL TEMPERATURE RETENTION is ensured by the double walled thermos insulation technology for you to enjoy coffee, hot and cold drinks longer whilst still being comfortable to hold, so it’s great for kids, mom, women and girls. PERFECT 20 OZ SIZE amongst drinking bottles and ecofriendly sweat resistant construction provides maximum benefit of comfort and capacity and the strong chiseled design fits securely in standard vehicle holders. 100% PREMIUM QUALITY RUST RATTLE AND AFTERTASTE FREE from the extreme robust insulating durable drinkware that sets it apart from the rest so you will never have to buy another flask again and preserves the natural taste for you whether you use it for smoothie, water, tea, vodka or other alcohol. RETAINS ITS FINISH EVEN AFTER MANY USES AND WASHES giving you great value and years of reliable service to enjoy with a lifetime warranty should an unlikely problem develop. Satisfaction guarantee or replacement and Free PDF guide included. Users say: "Great product I'm very happy with it and how it keeps my pop cold. I was amazed by how well it cleans up even after leaving stuff in it overnight. I will be getting more for sure so I hope they stay at this price." 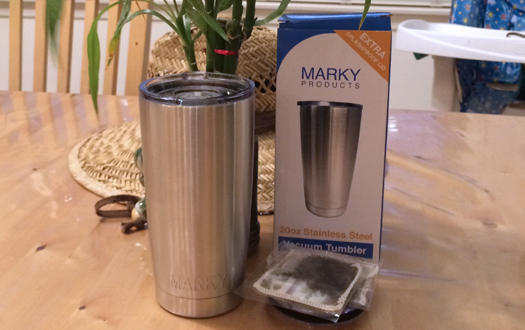 Marky Products is a premier brand of durable, long-lasting kitchen and beverage products. We're steadily building a reputation with our customers for incredible products and incredible customer service.